Technically this is a music video, but if after watching it you don’t feel like you want to see a whole movie made in this style… well, I don’t have words for you. It’s done well enough that I think it’s ok to call it a film. The story centers around a sky captain making his way across the sky, making peace with what came before and steadying himself on what may come next. Accompanied by a large dog-sized dragon, he sees the green glow just past an oncoming storm and must make his decision on how to deal with it. Whether he should avoid it or push through to the other side. This feels like the end of his journey. Whether that implies his death or simply his last grand adventure, I’m not entirely sure. Using a technique that reminds me a bit of Sin City with that mixture of animation and stylized actors. His goggles remain on his face, the orbs acting as two beacons in the dark night. They are our proxy to his eyes, able to still convey emotion even without being able to see what lies beneath. This film has no spoken dialogue, but the song itself acts as our emotional center. It builds slowly, quietly, a simple peace. And then, when the storm crashes into the ship, and he is fighting the currents, the volume raises… crashing into the listener. Once through the rain and the wind, he sees the green light in the distance and pushes his machine directly toward it. On my second watch, I brought up the lyrics and listened to the song only, allowing my memory of the scenes to supply the visuals. The storm carries all the mistakes he made. It carries the past away. And then it carries him onto his next (final) destination. Or, perhaps he rids himself of those things. And by unburdening, he allows himself to actually become truly free. Check it out and you tell me. Is this the end or the beginning? You can find more music from Lovett on his website, as well as a behind the scenes for this video. John McGuire is the author of the supernatural thriller The Dark That Follows, the steampunk comic The Gilded Age, and the novellas Theft & Therapy and There’s Something About Mac through the Amazon Kindle Worlds program. 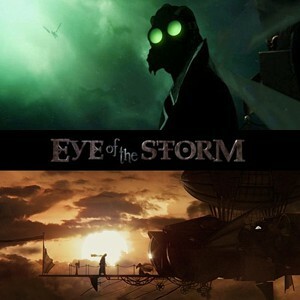 Tagged Ben Lovett, Christopher Alender, Eye of the Storm, Highway Collection, Music Video, Steampunk, Steampunk Fridays.